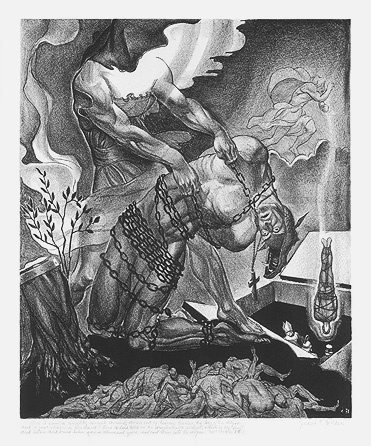 Isaiah 25:9 - - c.1935, Lithograph. Edition c. 25. Signed in pencil. Inscribed And it shall be said in that day, Lo, this our God, we have waited for him, and he will save us, this is Jehovah, we have waited for him, we will be glad in his salvation  Isaiah 25:9 in pencil. Image size 10 15/16 x 8 15/16 inches (278 x 226 mm); sheet size 15 x 10 7/16 inches (381 x 265 mm). A fine, rich impression, on cream wove paper, with full margins (3/4 to 2 1/8 inches), in excellent condition. Created for the Philadelphia WPA. 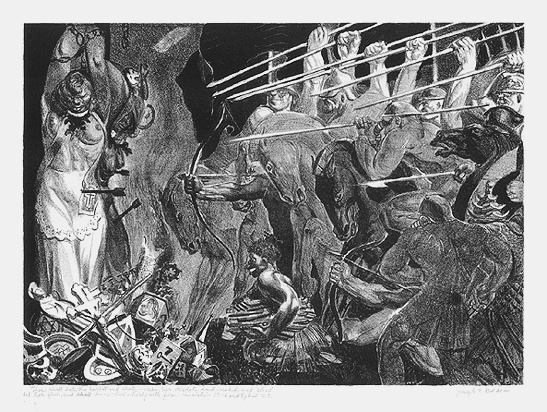 Revelations 17-18 and Ezekiel 23 - - c.1935, Lithograph. Edition c. 25. Signed in pencil. Inscribed These shall hate the harlot, and shall make her desolate and naked, and shall eat her flesh, and shall burn her utterly with fire. Revelations 17-16 and Ezekiel 23. in pencil. Image size 8 15/16 x 12 5/16 inches (226 x 313 mm); sheet size 10 1/2 x 15 inches (267 x 381 mm). A fine, rich impression, on cream wove paper, with full margins (11/16 to 1 1/2 inches), in excellent condition. 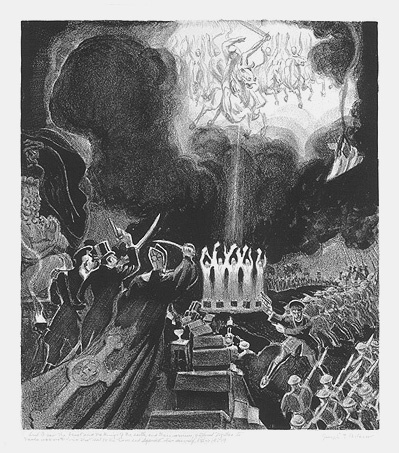 Revelations 19:19 - - c.1935, Lithograph. Edition c. 25. Signed in pencil. Inscribed And I saw the beast and kings of the earth, and their armies, gathered together to make war with him that sat on the horse, and against his army. Rev. 19:19 in pencil. Image size 12 1/2 x 10 7/8 inches (318 x 276 mm); sheet size 14 3/8 x 12 1/2 inches (365 x 318 mm). A fine, rich impression, on cream wove paper, with full margins (11/16 to 1 inch), in excellent condition. 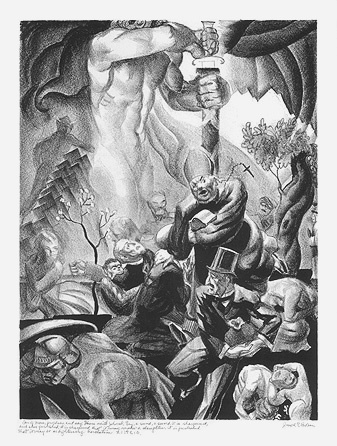 Revelations 20:1 - - c.1935, Lithograph. Edition c. 25. Signed in pencil. Inscribed And I saw a mighty angel coming down out of heaven, having the key of the abyss and a great chain in his hand. And he laid hold on the dragon, the old serpent, which is the Devil and Satan, and bound him for a thousand years, and cast him into the abyss. Rev. Chapter 20.1, in pencil. Image size 12 1/8 x 10 inches (308 x 254 mm); sheet size 15 1/8 x 12 1/2 inches (384 x 317 mm). A fine, rich impression, on cream wove paper, with full margins (1 1/16 to 1 1/2 inches), in excellent condition. 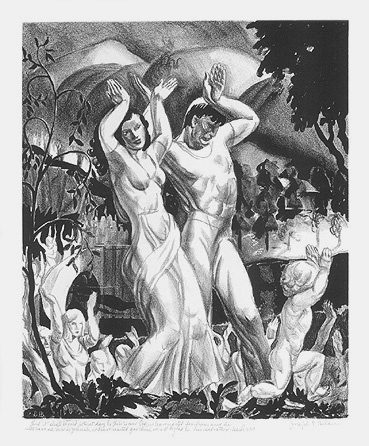 Revelations 21:9 & 10 - - c.1935, Lithograph. Edition c. 25. Signed in pencil. Inscribed Son of man, prophecy, and say, thus saith Jehovah: Say, a sword, a sword, it is sharpened, and also furbished; it is sharpened that it may make a slaughter, it is furbished that it may be as lightning. Revelations 21: 9&10. in pencil. Image size 12 x 8 15/16 inches (305 x 226 mm); sheet size 15 3/16 x 11 1/2 inches (386 x 292 mm). A fine, rich impression, on cream wove paper, with full margins (1 1/4 to 1 7/8 inches), in excellent condition.